This is a fantastic video! 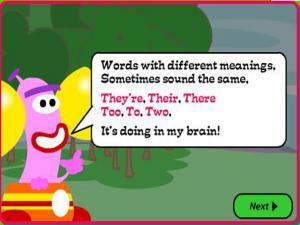 Learn the difference between THERE, THEY'RE and THEIR by watching the clear explanations and fun examples. 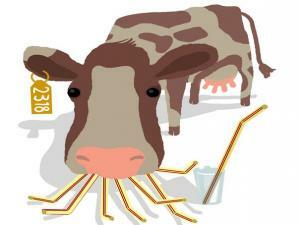 You should have no problem understanding these tricky homophones after this lesson! This is a great game with lots of audio interaction, explanations and help. 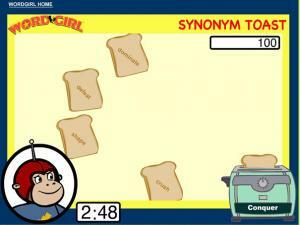 First, play the matching pairs game and match the homophones with the correct spelling to the picture cards. Then complete the sentences with the correct word. Don't worry if you get one wrong, you will be given a full explanation as to the answer. When you have finished, you can read your story! Help the Captain solve the riddles and learn about words that sound the same, are spelt the same but have a different meanings! How many do you know already? Read the story carefully and pick the correct spelling to fill the gaps. When you have finished, click on the "Check my Spelling" button to see your score. Good luck. Read the sentence and click on the word with the correct spelling that completes it. Remember homophones are words that sound the same, but are spelt differently and have a different meaning. This is a good resource to test how many you know. The spellings of these words are often mixed up because they all have a similar pronunciation. Pick the correct spellings from these sentences and see how many you get right. Try reading out the sentences as well and really think about how you are saying each word. Read the sentences, then pick the correct word from the pull down list to fill the gap. When you have done them all, click on 'finished' to see your score. 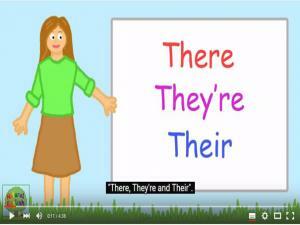 This exercise gives you practice in using the homophones 'there', 'their', and 'they're'. Read the sentence and click on the buttons to select the correct answer. 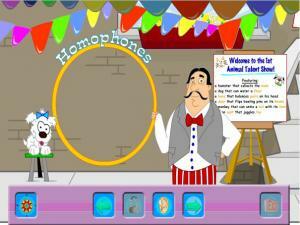 This is a fun, simple introduction to homophones. 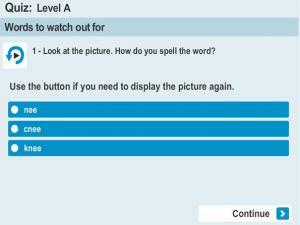 Look at the picture and the two given words, then click on the word that matches the picture. There are 50 to try! 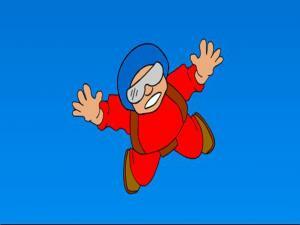 Will you unjumble the letters in time to save the skydiver? 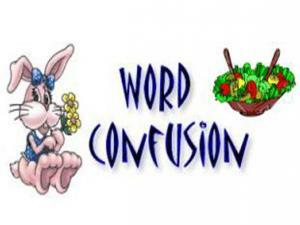 A homophone is a word that sounds the same as another word but has a different meaning and different spelling. Examples are ‘to’, ‘too’ and ‘two’. Do you think you understand? 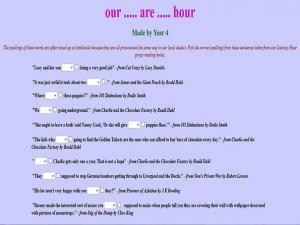 Each phrase has an incorrect homophone in it – work out what the homophone is and type the correct spelling. 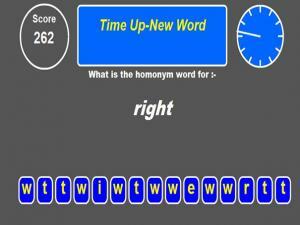 The correct word is shown with it’s letters jumbled up below the question. Welcome to the 1st Animal Talent Show! Find the matching homophones and help fix the poster for the Show. 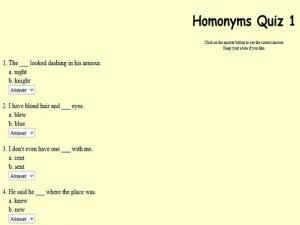 This is a great resource with lots of examples and exercises to help you practice recognizing homophones. Words with different meanings sometimes sound the same. Take this BBC spelling challenge to see if you know the different meanings for these homophones. Listen to the two sentences and pay attention to the context of the sentence. 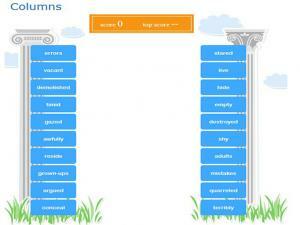 Choose a word from the word bank and type in the correct one for each sentence. You can listen to the sentences as many times as you like. There is also a dictionary to help if you get stuck. Homophones are words that sound the same but have a different meaning. For example, "hair" and "hare". 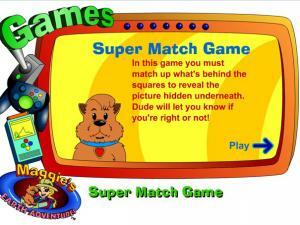 In this game you must match up the homophones under the squares to reveal the picture hidden underneath. Dude will bark to let you know if you are right! 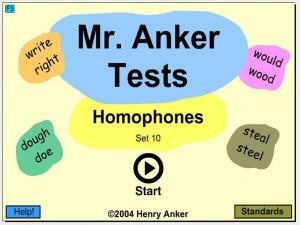 This resource tests your knowledge of homophones. Read the sentence and choose the correct homophone to fill in the gap. 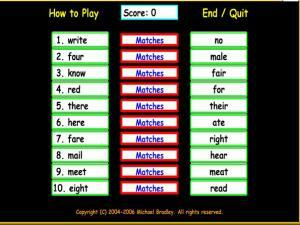 This is a match up game where you have to find the matching homonyms. Once you have completed one grid, start over with a new set of words! 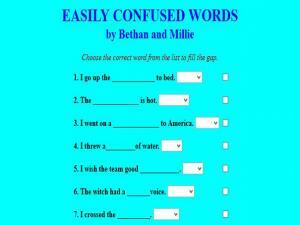 Read the sentences and choose the correct words out of the 2 homophones listed to fill in the blank. Help Regan the Vegan make fresh salad. Choose the correct word to complete each sentence. Start the game by choosing a level: easy or hard. Read the sentence and the two homonyms. Choose the correct word to complete the sentence. Remember, homonyms have the same pronunciation but different meanings! For every correct answer add another ingredient to Regan's salad. Spell the homonym for the word provided. A new word appears every 10 seconds so work fast! There are 2 other games to try after this one. 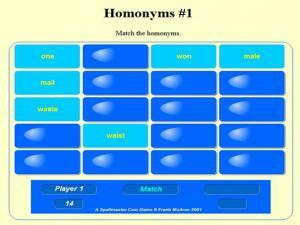 A memory game to help you recognize homonyms. 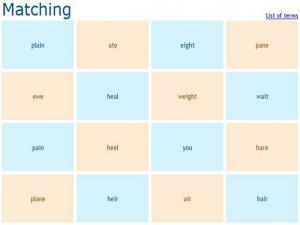 Click on the cards to reveal the words and find the matching pairs of homonyms. 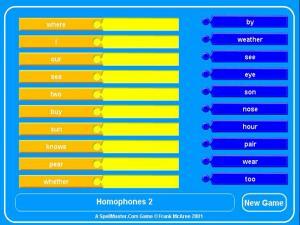 Do you know these homophones? Match the correct pairs of homophones by clicking on any word on the left then clicking on the matching word on the right. Get them right and collect points. Get them wrong and have points deducted! How many points can you get by the end? Check your scorecard to see all the right answers and your overall score. Help the sheep get home from the Petting Zoo. Read the phrases that make up a sentence along the train. 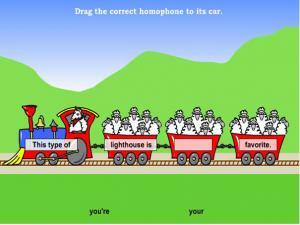 Drag the correct homophone to its car to complete the sentence correctly. Get it wrong and the sheep will let you know to try again! When you have got enough right the train will bring the sheep home! Read the words on the left hand side of the screen. Then click on a word on the right and drag it to the word which matches the same pronunciation as the word on the left. Check how many you got right. You can always re-do the game just to make sure. A fun game against the clock! Click on the word that has a similar meaning as the toast in the toaster in the bottom right corner. You get points for every correct synonym but you lose points for incorrect ones as well! Practice your understanding of homonyms, as well as your reading skills! Complete the paragraph by spelling the correct word (homonym) that goes in the blank. 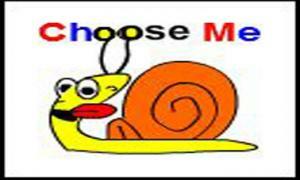 Homonyms are words with the same sound and spelling but different meanings. Homophones are words with the same sound but different spellings and meanings. Puns are homonyms and homophones that are funny. To play the game: Look at the picture and read the rhymes to guess the words. If your answer is correct, you will get a new homonym to guess. A variety of quizzes that range from easy to difficult. Select the correct word for the sentence. Self-checking. Find the correct word to complete the sentence. 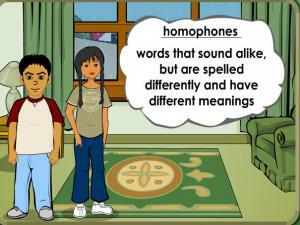 All the words are homophones - they sound the same but have a different meaning. There are several levels of quizzes for you to try.